Another on my client’s list of exotica is the HMS Albion. This 1/700 Resin from Atlantics Waterline is a very expensive example of only fair resin crafting. The kit itself is rather roughly poured in virtually one large chunk. Just the upper radar towers, bridge pieces, landing craft and crane are added on. Perhaps less than a dozen pieces in the entire kit. The pieces that are supplied are mostly that horrible white metal again roughly poured. This kit does come with PE however, they do not include railings for the lower decks. The upper deck railings and helo deck netting which are provided are way too thick to be of much use. The PE provided for the radar arrays is again way too thick and furthermore is ridiculously inaccurate. The single casting includes anchor chains that look like they were applied with a cake frosting tube and must immediately be removed. There is more to criticize than to love in this kit as it doesn’t appear that those making the model had spent much time actually looking at the HMS Albion. It is a very unusual ship and not many options exist other than this particular kit, but a fair amount of work will be necessary to get it looking marginally decent. This particular build uses Lion Roar railings and helo deck netting, HO scale anchor chain and scratch built upper radar assemblies. The goalkeeper guns on the front and back were omitted at the request of the client and the sea sparrow launcher used in the front and a phalanx to be added on the back. Nice build! When I first read the post, I thought you built the pre-dreadnought! Is this the same type of ship shown on UK TV series ''Warship'' ? It is. The one in the programme was Albion's sister ship Bulwark. 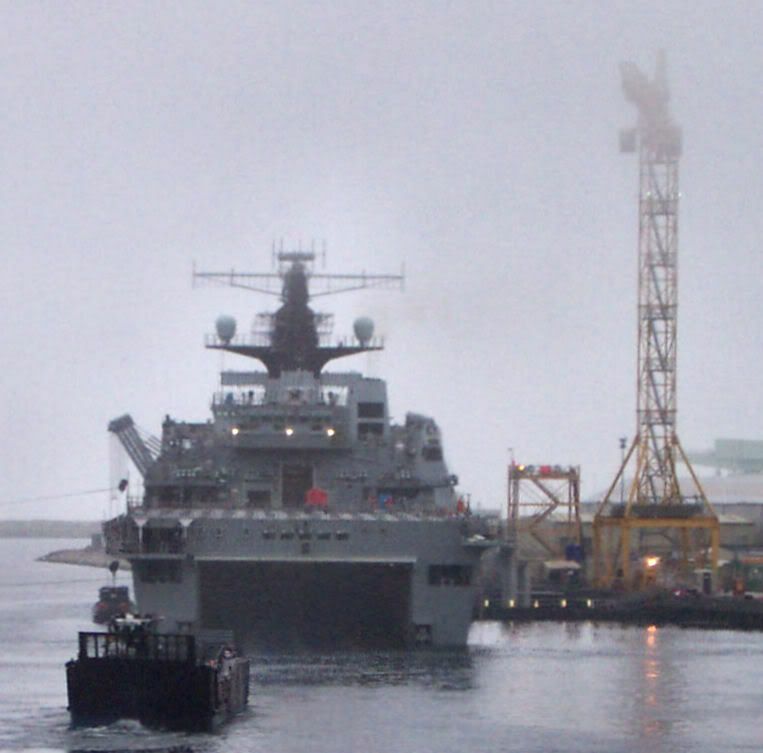 HMS Albion's dock trials here in Barrow.